Where the need for speed is the way to succeed. Master the souped-up secrets of synchro monsters and blow away the competition with the first turbo-charged booster pack. 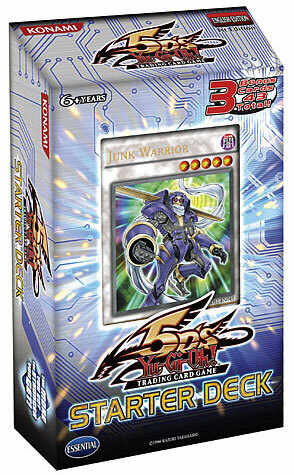 The duelist genesis Yu-Gi-Oh 5D's trading card game available now. You can be fast or be last. Be the first to emulate Yusei, the new hero with the Junk Warrior Synchro Monster and collect all his cards. Get ready and get set because the 5Ds Starter Deck is sure to leave all other Duelists in the dust. Duel like the hero of the new Yu-Gi-Oh 5Ds TV show. Contains all the hero's cards from the premier episode.